Hello PSS fans! This is Charles Swanson, recently minted doctor of plasma physics and PSS’s newest employee. 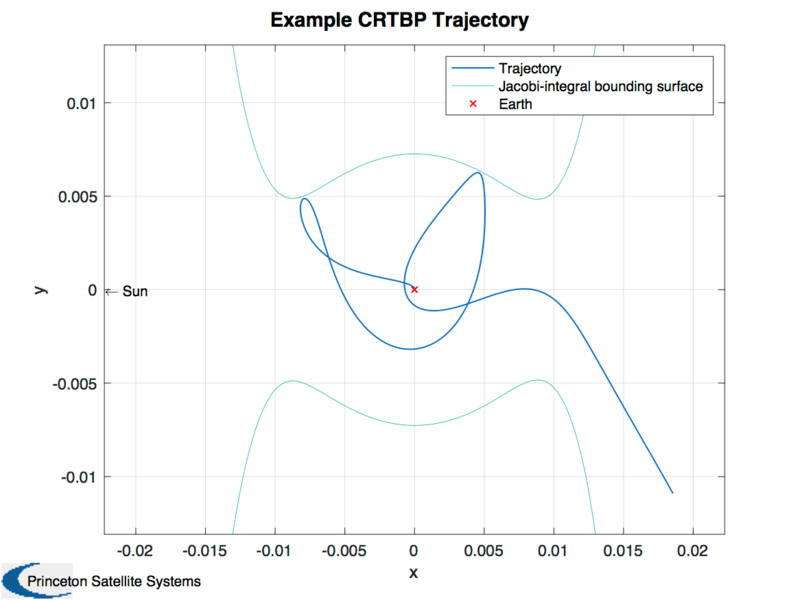 It’s my distinct pleasure to discuss our most recent NASA contract: A Phase III SBIR to integrate our Low Energy Mission Planning Toolbox (LEMPT) into NASA’s open source Orbit Determination Toolbox (ODTBX). Have you read about the kinds of maneuvers conducted by Hiten and AsiaSat 3 that allowed them to reach orbits that would seemingly be outside their Delta-V budgets? Have you always wondered how one goes about planning such maneuvers? What about the Lunar Gateway from which NASA plans to stage missions to the surface of the Moon in the coming decades? What kinds of clever orbital tricks can we use to get to, from, and about the Moon with the minimum possible fuel? This LEO to Lunar Orbit mission takes just one impulsive burn of 2.8 km/s. It loops way outside the Moon and back in for a ballistic capture. 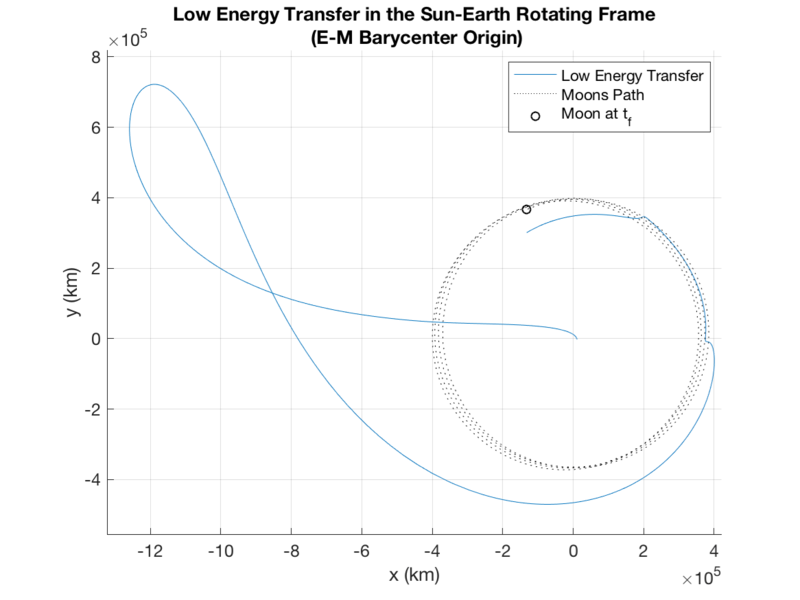 To go from LEO to a low lunar orbit usually takes almost 4 km/s of Delta-V. The maneuver depicted takes only 2.8 km/s. This is the kind of planning capability that NASA would like for their ODTBX. From now until December, we’ll be integrating the LEMPT into ODTBX, where it will help NASA mission planners evaluate all of their options along the trade-off of mission time and Delta-V. This is a periodic orbit in the Sun-Earth-Spacecraft system. 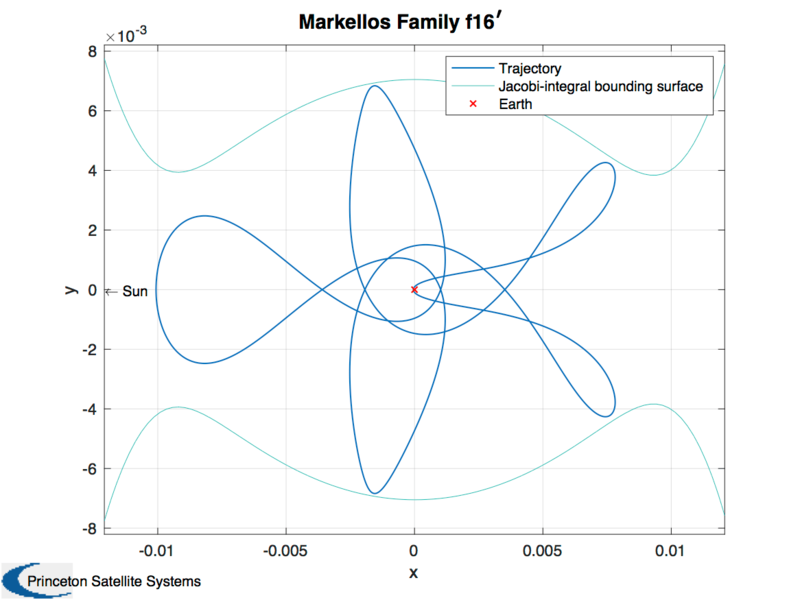 Periodic orbits are rare in such systems. This orbit starts with only 0.01% more velocity than the periodic orbit but escapes the Earth entirely. This is an example of chaos. It’s this chaos that the LEMPT leverages to plan exotic and efficient maneuvers. This entry was posted in Aerospace, Software and tagged low energy mission, lunar missions, orbit maneuver, Simulation by Charles Swanson. Bookmark the permalink.